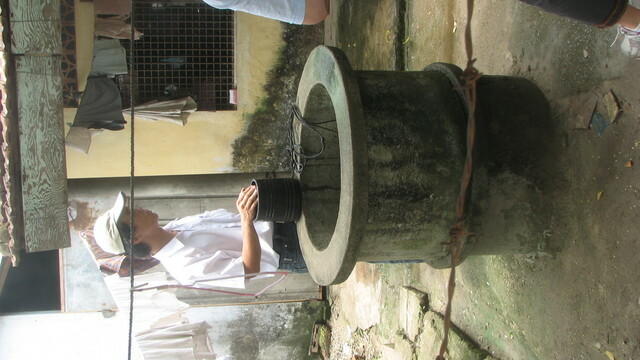 East Meets West (EMW) has been implementing its Clean Water Program (CWP) in the Central Region of Vietnam since 1996, providing piped and treated water to rural communes and hamlets. Over the last few months, To maximize community health impacts of improved RWSS facilities, it is recommended that the CWP support a community and school-based Information, Education and Communication (IEC) program to improve hygiene behavior and support for sanitation activities aimed at reducing water related diseases (e.g., diarrhea, skin diseases, worm diseases, etc.). The IEC will focus on improving hygiene practices such as hand washing with soap, community-level environmental sanitation, household level wastewater drainage (not sewerage) programs and community level solid waste management. Women, teachers, community leaders and local authorities and the poor will be encouraged to get involved in and benefit from IEC activities. The close working relationships already developed by EMW with local authorities in Quang Nam would help facilitate the implementation of such a program component. The CWP has been expanded to include environmental sanitation (sanitary latrines and hygiene behavioral change promotion) for both the household and schools in communities served by EMW. While the environmental sanitation program is still in its nascent period, EMW plans to go back to all of its water system sites to provide sanitation infrastructure and hygiene behavioral change promotion. This program has just recently started. 1) In how many communities has EMW already developed sanitary latrines? So far, EMW support for sanitary latrine construction has been limited to 4 communes. About 200 (out of a total number of 500 households) family latrines have already been built in Tam Anh Nam commune, Nui Thanh district, Quang Nam province. The remaining 300 are still in progress. Drinking water projects have already been implemented by EMW in the proposed beneficiary communities who will have access to subsidized improved household sanitary latrines. They will hav e the choice of either a standard pour-flush latrine with double vault septic tanks, or an EcoSan latrine. EMW will provide a 25% subsidy of the total cost to interested households. Water has already provided to the school by the East Meets West Clean Water Program under separate funding. 200 families getting household latrines. Thus, this initial $5,000 research grant will support EMW’s efforts to expand and refine its pilot sanitary latrine program, and to assess beneficiary preference and subsequent interest in adopting the EcoSan latrine, once they understand the potential benefits of doing so. EMW representatives have already met with representatives of the Stockholm Institute to discuss their EcoSan program, and will discuss further details about customer preference, and relative costs. As such, this will serve as an informal initial pilot study about customer preference between the two types of latrines. Hygiene and sanitation behavioral change will be a component of this project to encourage people to more effectively use their latrines to reduce water borne diseases. 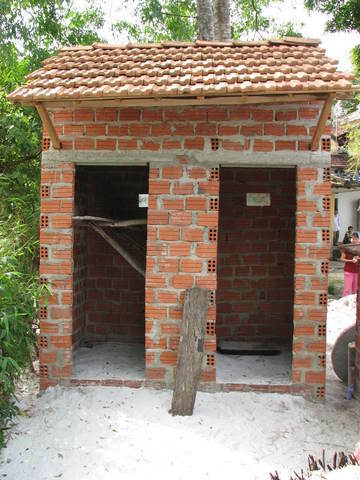 The basic sanitary latrine in this part of rural Vietnam is a one-hole, pour flush double vault (septic tank) latrine, with a shelter (typically brick ventilated walls, and a corrugated iron roof) for privacy. However, an increasing number of HHs prefer to upgrade their basic latrines to a bathroom that contains the latrine and bathing facilities, along with improved aesthetics (tiled walls are popular for those who can afford them). The EMW design is based on designs that were promoted by International Development Enterprises (IDE) during their recent multi-year market-based hygienic latrine promotion project in Quang Nam. 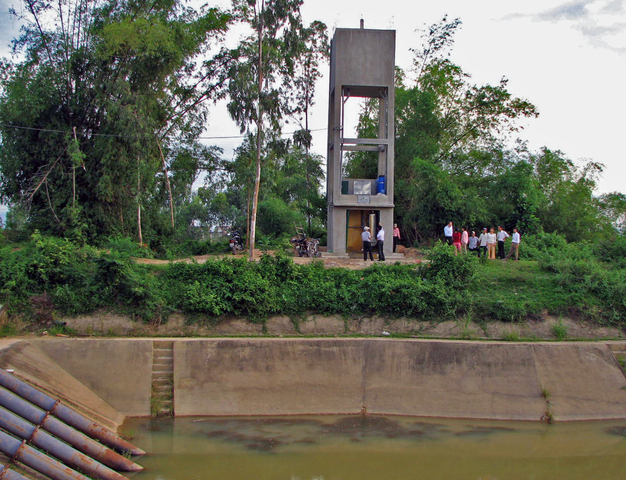 EMW’s latrines have been constructed mainly in Quang Nam Province, which is also the main focus of the EMW Clean Water Program thus far. The EMW program takes advantage of the availability of trained latrine builders whom IDE had trained-up during their program, as well as IDE’s promotional and marketing activities that helped to identify and expand the market demand for hygienic latrines. Alternative latrine designs – EMW also intends to initiate a pilot program for the promotion of Eco San latrines. Ecological sanitation (also called 'EcoSan') is structured on recycling principles that keep the eco-cycle in the sanitation process closed. This system uses human excreta as a resource: human waste is processed on site until they are free of pathogenic (disease-causing) organisms. After this process, the sanitized excreta can be used for agricultural purposes. EcoSan toilets have several advantages over standard pour-flush latrines, including an EcoSan toilet can solve problems like bad odors, flies and poor hygiene, and is a comfortable and safe alternative to pour flush latrines. However, as this is not a common design in Vietnam, EMW will promote the EcoSan toilet as a useful alternative to the standard pour-flush latrine. The extent to which they are financed under this project will depend upon the willing of families to adopt the new technology. 3) How much do the improved latrines cost, and who pays? EMW agreed to partially subsidize 126 HH latrines (pour/flush latrines with septic tanks) in the first phase of this program. An additional 74 HH latrines will be completed in the second phase. The EMW subsidy is 25 USD out of the base cost of 125 USD for the standard HH latrine (these costs are slightly higher than the original proposed cost because of the steadily inflating cost of materials and skilled labor (see below). Given the significant unmet demand on the part of potential customers, EMW anticipates a substantial expansion of this program, as suitable funding sources are identified. Unmet demand for improved sanitation in Quang Nam (and some of the surrounding provinces) remains high, and EMW intends to help meet and further stimulate that demand. 4) What are the basic design features? The basic sanitary latrine is a one-hole, pour flush double vault (septic tank) latrine, with a shelter (typically brick ventilated walls, and a corrugated iron roof) for privacy. However, an increasing number of HHs prefer to upgrade their basic latrines to a bathroom that contains the latrine and bathing facilities, along with improved aesthetics (tiled walls are popular for those who can afford them). The EMW design is based on designs that were promoted by International Development Enterprises (IDE) during their recent multi-year market-based hygienic latrine promotion project in Quang Nam. EMW’s latrines have been constructed mainly in Quang Nam Province, which is also the main focus of the EMW Clean Water Program thus far. The EMW program takes advantage of the availability of trained latrine builders whom IDE had trained-up during their program, as well as IDE’s promotional and marketing activities that helped to identify and expand the market demand for hygienic latrines. 5) How about alternative latrine designs? – EMW also intends to initiate a pilot program for the promotion of Eco San latrines. Ecological sanitation (also called 'EcoSan') is structured on recycling principles that keep the eco-cycle in the sanitation process closed. This system uses human excreta as a resource: human waste is processed on site until they are free of pathogenic (disease-causing) organisms. After this process, the sanitized excreta can be used for agricultural purposes. EcoSan toilets have several advantages over standard pour-flush latrines, including an EcoSan toilet can solve problems like bad odors, flies and poor hygiene, and is a comfortable and safe alternative to pour flush latrines. However, as this is not a common design in Vietnam, EMW will promote the EcoSan toilet as a useful alternative to the standard pour-flush latrine. The extent to which they are financed under this project will depend upon the willing of families to adopt the new technology. 6) What is the typical cost of a HH latrine, and how does the co-financing arrangement work? The typical cost of a basic pour-flush latrine with a septic tank is about US$130 (about VND 2.1 million), reflecting the recent significant increase in the price of goods, materials and skilled labor in Vietnam, due at least in part to the booming local economy. EMW provides a subsidy of 20% of the cost of a basic pour/flush latrine as a financial stimulant to encourage families (especially low-income families) to build improved sanitary latrines. The EMW subsidy is 20% of the total cost, or about VND 420,000, or about $26/HH. Sometimes people choose to build upscale versions that cost up to $300-500 for a tiled bathroom, a pour-flush latrine(s) and a shower, financed by the users. 7) What are the processes and institutional arrangements for program implementation? Although the sanitation program has been carried out somewhat informally thus far due to very limited funding, the basic EMW approach is to carry out a needs assessment in communities already supported by the EMW Clean Water Program, After the community is selected as project location, EMW then has official meetings with the CPC and interested community members to discuss various aspects of project implementation, including selection criteria, cost sharing, Plan of Action, implementation process, role and responsibilities of each of the parties, and the financial control system. The MOU between EMW and CPC is signed at this time confirming the agreed upon points. The Project Management Board is then established with the concurrence of Vice Chairman of Commune PC, the Head of Commune Health Station, Heads of project hamlets, and the Women’s Union. The CPC works with hamlet level officials and individual households to prepare the list of families potentially interested in building partially subsidized sanitary latrines. EMW water team staff then visit individual households to verify the interest of potential beneficiaries households. The subsequent meetings and technical training activities with selected beneficiaries is then conducted, including project orientation, fully informing potentially interested HHs of their roles and responsibilities, and discussing details of the implementation process. An Agreement / Registration letter between EMW and interested HHs is then signed officially The Project Management Board coordinates with EMW assigned staff who will guide and the implementation of follow up activities during project implementation. When the construction completed successfully and meets project quality control standards, the subsidy payment will be made directly to the HHs by EMW, witnessed by CPC and the PMB. A Hygiene and Sanitation Education program will be carried out in coordination with the latrine construction program. •	Population density, which has a significant impact upon the cost of the water transmission and distribution pipelines. The cost of pipes is typically the single highest cost item in the typical water system construction budget. Thus, this initial $5,000 research grant will support EMW’s efforts to expand and refine its pilot sanitary latrine program, and to assess beneficiary preference and subsequent interest in adopting the EcoSan latrine, once they understand the potential benefits of doing so. EMW representatives have already met with representatives of the Stockholm Institute to discuss their EcoSan program, and will discuss further details about customer preference, and relative costs. As such, this will serve as an informal initial pilot study about customer preference between the two types of latrines. Equivalent of US$ 5 for annual maintenance of latrines. The proposed budget of $5,000 will cover the 25% subsidy cost of about 200 latrines, a mix of both EcoSan and standard pour-flush latrines with double vault septic tanks. Users will choose which model they prefer. EMW, in the form of staff time for project development, community mobilization and liaison with local authorities, construction management and quality control. (25% of all materials and equipment cost). Households that are willing to accept the 25% subsidy (about US $25) and pay the remaining 75% (about US$75. EcoSan latrines are likely to be somewhat less expensive than the standard latrine, which may may attract more people to select that choice..
Will the study also investigate the acceptability of using human waste as fertilizer? Is there a demand for the level of fertilizer that would be available if EcoSan was fully adopted? 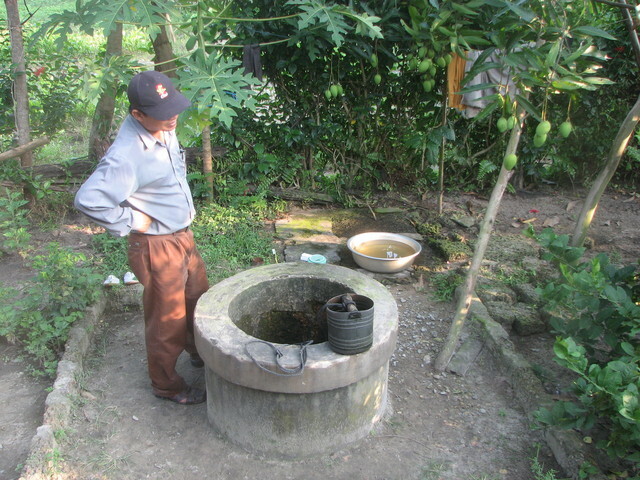 Human waste has been used as fertilizer in Vietnam for thousands of years, and continues to be used nowadays, but not to the extent that it was. The main problem is that many people who use composting latrines do not let it age sufficiently (6 months) so that the pathogens often still remain viable, thereby causing human health problems. I'm not sure what the level of demand is these days, but that could be something worth looking into. What is the average household income? Are there any concessions for the lower income families? work exchange? It sounds like some of the beneficiaries can afford to have more cost intensive tiled bathrooms. Do you know the ratio of people at each income level who have been able to purchase the toilets? Do you find some of the lower income households sharing? Given that you have already implemented at least 126 latrines, I'd be interested to hear if you have changed any of your strategies in implementation and outreach based on your experience. Marketing strategy that created demand? Community workshops? 1) We're up to 500 latrines installed now. More coming starting in January or so. 2) I'll send you the current sanitation program description. 3) Marketing strategy as per IDE. 4) Of course. Several at each site. 1) We're up to 500 latrines installed now. More coming starting in January or so. 2) I'll send you the current sanitation program description. 3) Marketing strategy as per IDE. 4) Of course. Several at each site. 1) Average household income of 75 typical EMW water scheme beneficiaries (from the EMW CWP Evaluation), ranges from VND 500,000 - 1,000,000 in many areas). So the official poverty criteria is now (about) VND 2,000,000 per HH. 2) No, everybody pays / works. 3) For the water program, every family has to pay for the cost of their house connection, water meter, and dig a specified length of pipeline ditch. No free lunch. 4) No, I don't know. Just to get the numbers clear: Did you already construct 126 latrines (in phase 1)? or are all of the 200 yet to be built? Thanks. Just to get the numbers clear: Did you already construct 126 latrines (in phase 1)? or are all of the 200 yet to be built? I just got an update on our sanitary latrine program. And how were the already constructed toilets financed? Loans? If I understand you right, the applied funding would be for 200 out of the 500 constructed toilets? 1) 25% subsidy provided by EMW, and 75% from household. Average cost is about US$ 100-120. 2) No, we have already constructed 500 latrines with in-house financing. The funding request to BPR is for an additional 200 latrines. 1) 25% subsidy provided by EMW, and 75% from household. Average cost is about US$ 100-120. 2) No, we have already constructed 500 latrines with in-house financing. The funding request to BPR is for an additional 200 latrines. Of course, sanitation is a very worthy project. BPR used to not fund just latrines alone (as far as I know), I think this shows how important the issue is becoming. These subsidy things are always a tricky business. Personally, I'd love to see a scaled subsidy based on income, but not sure how you would judge income - if it is anything like Nicaragua, there is no way to know from family to family what their income is, and definitely no way to verify it. I see you answered that you didn't know about the ratio at each income level that could afford to buy the toilet. Any idea about percentage of overall households that are unable to acquire sanitation? (we have to assume that they cannot afford, or that the education hasn't reached them yet). We fully subsidize costs here, in exchange for the sweat labour. Of course, I am interested to know if families are unable to get sanitation and how they can be reached. Someday, we may change to partial subsidies like yours, but I wonder what strategies can be used to make that work. Any thoughts you have on the matter would be welcome. By the way, what is a CPC? Is that the commune committee? Thanks for the other good questions above, clarified some of the other confusions I had. Scaled subsidies are too complicated. People also routinely under-report their monthly income (sort of like tax payers in most western countries), especially when there is a financial incentive to do so. To work well, subsidies must me clear, simple and easily applied. If it's made too complicated, people will be motivated to try to find the tricky ways around it. CPC is the Commune People's Committee. Any figures on the overall coverage in these areas in sanitation? i.e. what percentage of of overall households that are able/unable to acquire sanitation? Government figures are 60%, but few people would agree.with that seemingly optimistic level. I mean in these communities where you have worked - I am curious how many families cannot afford to pay? Don't know. As the sanitation program expands, we will have more information on such issues. Right now we are essentially in the startup phase, as we have only been co-financing latrines over the last 6 months or so, and have about 500 already built. We anticipate a major expansion of the sanitation program over this coming year, contingent upon funding availability. Please share the results of the study with PWX participants. This will be useful info. Sound proposal but it would be good to take this a step further and look at a way of creating a loan of 25% rather than a direct subsidy so that there is a 100% ownership and commitment from each family. I personally have not much background on toilets... but the projects seems to be reasonable and implementation transparent. Lots of learnings expected from this project! I appreciate that there will be a study conducted. I also like the fact that the beneficiaries will be offered options. As always, I am excited to fund latrines - they are the hardest things to fund. I like the fact that the community members pay a portion of the costs, ensures buy in, but would be interested in the future to know if any families are being left out. Good luck with the project.